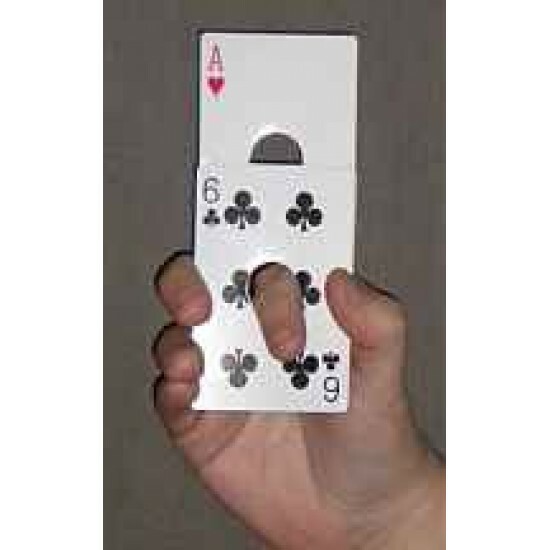 A safe and effective version of the "finger chopper" using playing cards. Effect : Performer displays four playing cards with a hole in the middle. One of these cards is pulled out of the packet, and the performer introduces his finger through the other three cards. The card pulled out is now pushed back into the packet and apparently penetrates right through the finger. The cards are removed from over the finger, one at a time, and the penetrated card is seen unharmed, over the finger, and can be handed for examination. We supply you the four cards gimmick for performance, so you can do this right away. Item comes in a convenient carry wallet, with photo illustrated instructions. The performer displays the Ghost Key - a large key that he invites his audience to examine to their heart's content.When the performer places the ke.. This is one of the finest one man floating ball effects. It enables you to float a gleaming ball very easily, and is a very baffling magic effect for .. This is a novel â€œcard trickâ€ which is entertaining as well as educational. Magician displays a stack of six card..